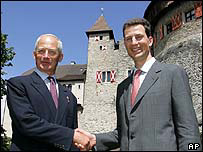 The ruler of Liechtenstein, Prince Hans-Adam II, has formally transferred the day-to-day running of the tiny principality to his son, Prince Alois. Prince Hans-Adam invited all of Liechtenstein's 33,000 inhabitants to a garden party to celebrate on Sunday. He has headed the state since his father Franz Josef II died in 1989, and his family has ruled for 300 years. The country, lying between Austria and Switzerland, is a tax haven under pressure to reform its banking system. Last year, the Council of Europe criticised the principality over constitutional amendments that increased the royal family's powers, allowing them to veto new laws and dismiss governments. Despite the power handover, Prince Hans-Adam said he had no intention of abdicating for at least another 20 years. Prince Alois, 36, the eldest of Prince Hans-Adam's four children, attended local schools before being sent to Sandhurst military academy in the UK. He appears to support his father's stance on constitutional affairs, saying the country should leave the Council of Europe if it decides to monitor democracy in Liechtenstein. But in his first speech as head of state on Sunday, Prince Alois acknowledged that the country was under pressure to crack down on money-laundering. "The crisis in the financial centre as well as the crisis in many European states show us how dangerous it can be if necessary, but perhaps unpleasant, reforms are not tackled promptly," he said, quoted by the AP news agency. Like Switzerland, Liechtenstein chose to remain neutral in World War II and stayed out of the European Union.